One of our greatest challenges at Lost Dogs of Wisconsin is educating owners, neighbors, family, friends and well-meaning strangers about lost dog behavior. We are often trying to do this in the “heat of the moment” when a dog goes missing and everyone is in a panic. Let’s face it – most people may only lose their dog once in their lifetime and understanding lost dog behavior is not something that is taught in public school. Lost dogs who are not being pursued, called, whistled to or pressured in any way will make wise decisions and may survive indefinitely. They will find food sources, water, hiding spots and shelter; even in extreme weather conditions. But when people panic and pressure a scared lost dog, that dog will make poor choices and be at great risk of getting hit be a car or a train; or falling through thin ice on a lake or river. 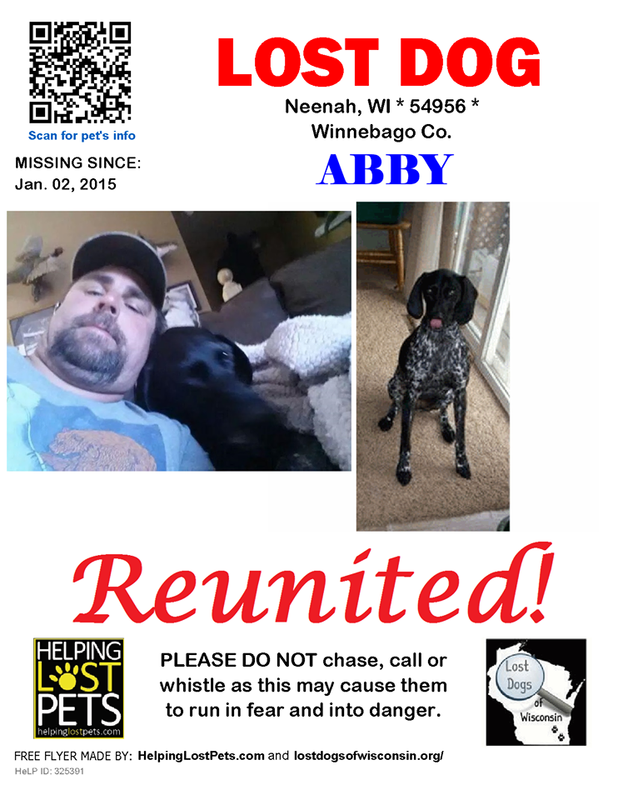 We would like to share this excerpt from Sara Miller who assisted in the search for Abby, a German Shorthaired Pointer missing during very cold weather in central Wisconsin. Thank you Sara for all of your help! Every person that educates the public on how to find a lost dog greatly increases the chances that more dogs will get home safely. Remember, never call or chase a lost dog. Use your volunteer manpower to distribute flyers and let the dog settle into an area and relax. Then you have a very good chance of a happy reunion. This entry was posted in Reunion Stories, Shy Lost Dog Strategies and tagged Abby, Appleton, lost dog, Lost Dogs of Wisconsin, shy dog. Bookmark the permalink.